Mandy was struggling to see the keyboard on her laptop and wanted to look at the options. Mandy lives with her husband and they manage independently with daily activities although Mandy is finding it harder to read small print and text. Mandy likes to send and receive emails from her grandchildren and a friend who lives in France. She prefers to use a laptop as it is more compact than a desktop and she can put it away when not in use. Mandy has reducing vision. 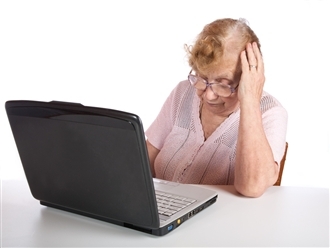 She has been shown how to enlarge items on the screen but has difficulty seeing the letters on the keyboard. She's been told that she can plug an extra keyboard into her laptop but wonders if any are available which she may find easier to use. Mandy thought that with both larger print on a keyboard and high contrast keys with black letters on a yellow background she would find it a lot easier to see the keys. Mandy thought that having larger keys as well as large high contrast labels on a keyboard may help make it even easier for her to use than the above standard key size, large print & high contrast keyboards. Mandy was not interested in large print keyboard stickers as she wanted to have the flexibility of a separate key board with her laptop (she liked to raise the laptop so its screen was higher). Her husband, who also used the laptop, was not keen on having stickers attached to the keys. Mandy tried a standard key size large print high contrast keyboard in her local Independent Living Centre (see list of Equipment Demonstration Centres on this site). She found it easy to use and so decided to buy one and not one of the larger big button keyboards. She bought one from a supplier listed on this site. Mandy got on well with her large print high contrast keyboard and her enlarged cursor and continued emailing, and now messaging, her friends and grandchildren.